How organizational instruction can help transform the processes and culture of your office. Many leaders are interested in their organization “going Agile,” but they wonder where to start. A great place to start is with a mass training event. That is, in-house instruction that allows the majority of the organization that develops software, as well as those that have or manage requirements for software, to all get in the same room at the same time and learn the concepts. Unlike online training, instruction provided to all the employees in one room at the same time can allow for discussion between each other and the Agile instructor. Details associated with the office’s idiosyncrasies related to their existing processes, users, and current products can be discussed, and the process of change can begin with those that will be using the processes on a daily basis—all while learning the concepts. 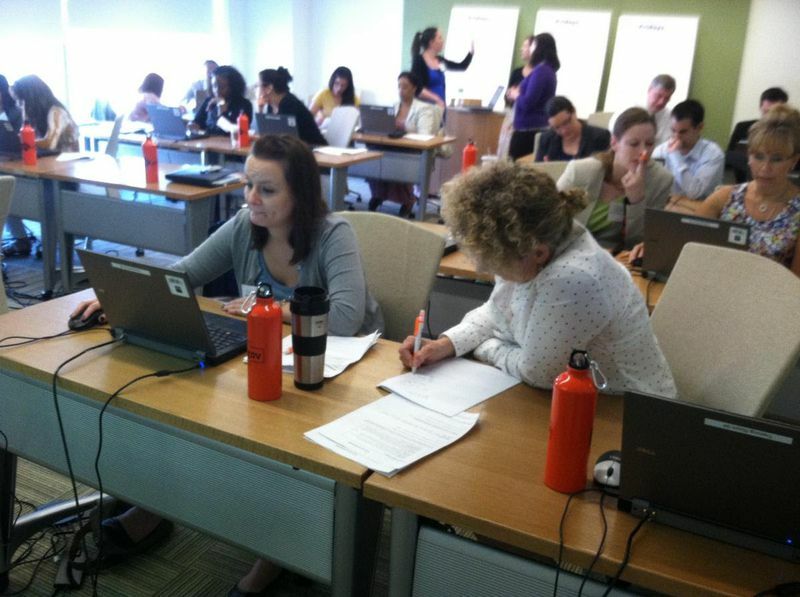 Federal employees participate in an on-site User Experience training class. Some offices will send a few key leaders or perhaps a couple software developers off to Agile training. This is very ineffective, as those few individuals come back with radically different ideas that no one else in the office is going to understand. The adoption of a different method of work like Agile requires a broad sense of understanding from multiple points of view throughout the organization. This understanding is impossible to reach without a large segment of the organization going through instruction together—in particular those that will be using the Agile method in their daily work. So, in-house mass training events create an opportunity for everyone involved in development to gain a more complete understanding of what the Agile method means for the organization. It allows the discussion to start regarding work roles, changes to existing processes, and how the office may need to reorganize to facilitate teaming and effective feedback. Perhaps most importantly, a mass training event can allow leaders to spread the opportunity to lead change throughout the organization—enlisting many to help shape and drive the method to improve their software, reduce their costs, and improve their overall service to their users. Check out some of DigitalGov’s recent articles on the agile methodology. Have a .gov or .mil email address? Join the Agile/Lean Community of Practice to connect with others at federal agencies working to increase team efficiency and customer satisfaction, while reducing project risk and cost.